Streptomycin is an aminoglycoside antibiotic primarily effective against gram-negative bacteria and Mycobacterium species. It is commonly used in cell culture media to prevent bacterial contamination. It has also been used to precipitate nucleic acids during protein purification techniques and to study mechanisms of Streptomycin resistance. Aminoglycoside antibiotics are composed of amino groups attached to glycosides. They bind the 30s ribosomal subunit, causing misreading of the mRNA sequence and inhibition of translocation. Consequently, protein synthesis is inhibited. Resistance to this antibiotic is conferred through mutations in the rpsL gene. The Streptomycin Sulfate EZ Pak™ is the fastest and easiest way to make a set amount of sterile streptomycin sulfate solution. The kit includes pre-weighed streptomycin sulfate powder, a sterile filter and a sterile container for the filtered solution. No need to calculate, simply add the stated amount of deionized H₂O, filter, and pour into the labeled bottle for easy usage. 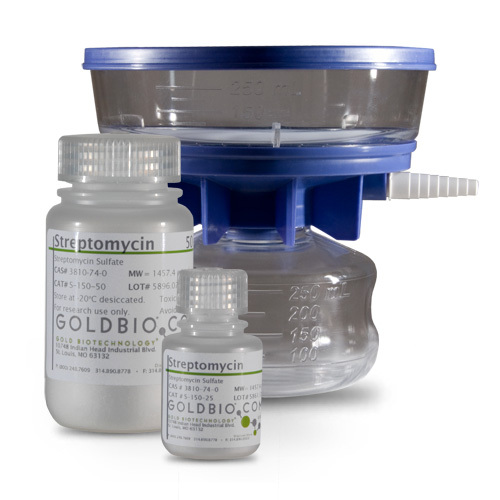 The EZ Pak™ includes high-quality GoldBio streptomycin sulfate, and the sterile solution is ready for tissue culture, bacterial media or any number of uses. The 25 ml, 50 ml, and 100 ml require a vacuum manifold for easy vacuum filtering, while the 10 ml pack size comes with a syringe filter. EZ-Pak Protocol for Reconstitution and Filtration of Streptomycin.